Last week, for an upcoming post to the interim blog of the atrocities early-warning project I direct, I got to digging around in ACLED’s conflict event data for the first time. Once I had the data processed, I started wondering if they might help improve forecasts of coup attempts, too. That train of thought led to the preliminary results I’ll describe here, and to a general reminder of the often-frustrating nature of applied statistical forecasting. ACLED is the Armed Conflict Location & Event Data Project, a U.S. Department of Defense–funded, multi-year endeavor to capture information about instances of political violence in sub-Saharan Africa from 1997 to the present.ACLED’s coders scan an array of print and broadcast sources, identifiy relevant events from them, and then record those events’ date, location, and form (battle, violence against civilians, or riots/protests); the types of actors involved; whether or not territory changed hands; and the number of fatalities that occurred. Researchers can download all of the project’s data in various formats and structures from the Data page, one of the better ones I’ve seen in political science. Subsetting and summarizing the data on violence against civilians in Somalia, which also took some care because there was an extra space at the end of the relevant label in some of the records. Once I had done these things, it was easy to generalize it to the entire data set, producing tables with monthly counts of fatalities and events by type for all African countries over the past 13 years. And, once I had those country-month counts of conflict events, it was easy to imagine using them to try to help forecast of coup attempts in the world’s most coup-prone region. Other things being equal, variations across countries and over time in the frequency of conflict events might tell us a little more about the state of politics in those countries, and therefore where and when coup attempts are more likely to happen. Well, in this case, it turns out they don’t tell us much more. The plot below shows ROC curves and the areas under those curves for the out-of-sample predictions from a five-fold cross-validation exercise involving a few country-month models of coup attempts. The Base Model includes: national political regime type (the categorization scheme from PITF’s global instability model applied to Polity 3d, the spell-file version); time since last change in Polity score (in days, logged); infant mortality rate (relative to the annual global median, logged); and an indicator for any coup attempts in the previous 24 months (yes/no). The three other models add logged sums of counts of ACLED events by type—battles, violence against civilians, or riots/protests—in the same country over the previous three, six, or 12 months, respectively. These are all logistic regression models, and the dependent variable is a binary one indicating whether or not any coup attempts (successful or failed) occurred in that country during that month, according to Powell and Thyne. As the chart shows, adding the conflict event counts to the base model seems to buy us a smidgen more discriminatory power, but not enough to have confidence that they would routinely lead to more accurate forecasts. Intriguingly, the crossing of the ROC curves suggests that the base model, which emphasizes structural conditions, is actually a little better at identifying the most coup-prone countries. The addition of conflict event counts to the model leads to some under-prediction of coups in that high-risk set, but the balance tips the other way in countries with less structural vulnerability. In the aggregate, though, there is virtually no difference in discriminatory power between the base model and the ones that at the conflict event counts. So those are the preliminary results from this specific exercise. (The R scripts I used are on Github, here). I think those results are interesting in their own right, but the process involved in getting to them is also a great example of the often-frustrating nature of applied statistical forecasting. I spent a few hours each day for three days straight getting from the thought of exploring ACLED to the results described here. Nearly all of that time was spent processing data; only the last half-hour or so involved any modeling. As is often the case, a lot of that data-processing time was really just me staring at my monitor trying to think of another way to solve some problem I’d already tried and failed to solve. In my experience, that kind of null result is where nearly all statistical forecasting ideas end. Even when you’re lucky enough to have the data to pursue them, few of your ideas pan out. But panning is the right metaphor, I think. Most of the work is repetitive and frustrating, but every so often you catch a nice nugget. Those nuggets tempt you to keep looking for more, and once in a great while, they can make you rich. When I got up this morning, I had an email in my inbox from Patrick Mathangani, a writer for Kenya’s The Standard. He said he was researching a story on coups in Africa, had found my blog and piece for Foreign Policy on the subject, and wondered if I’d answer a few questions. I thought some of this blog’s readers might be interested in that exchange, too, so here are Mr. Mathangani’s questions and my replies. In your 2013 forecast, 22 of these countries are in Africa. Checking through data over the years, the continent appears to have had more than its share of coups since the 1950s, perhaps explaining why coups have been seen as an African problem. Your analysis appears to confirm this. What’s your view on this? I don’t think coups are an African problem so much as they’re a problem of poor countries with weak states, and Africa happens to have more than its fair share of those. We’ve seen the same pattern in every other part of the world, just at different times in history. Latin America, for example, suffered lots of coups in the 1960s and 1970s, but the incidence dropped off sharply in the past couple of decades as most countries in the region got less poor and more democratic—and, crucially, after the Cold War ended and the U.S. and USSR stopped sponsoring or supporting coups in the region as a way to scratch at each other. I expect we’ll see the same decline in the frequency of coups in Africa as more and more countries get into positive spirals of development. We’ve already seen a decline in the post-Cold War period, probably due to the end of those superpower proxy struggles, and I’m guessing that current patterns of economic growth and democratization will solidify that shift just as they did in Latin America and Europe before. What, in your view, makes Africa such fertile ground for coups? I think my answer to number 1 goes about as far as I can on this question. I’m sure there are other aspects, too, but I’ll leave those to the regional pros to address. This year, we’ve had two distinct political events in Africa that show a sharp contrast and mixed fortunes for the continent’s push for good governance. These are a seamless transition in Kenya, and a coup in CAR. What do these portend for Africa’s future and struggle for democracy? As William Gibson supposedly said, “The future is already here. It’s just not evenly distributed.” To me, Kenya looks like a state that’s on the edge of that virtuous cycle of development I mentioned earlier, while CAR still isn’t even really a state in the conventional sense. It’s interesting to see Tanzania, Kenya’s neighbour, at number 22 in your list. Tanzania has been relatively stable, why does it land on the model? Tanzania ranks relatively high on the list because in spite of its reputation as a stable democracy, it’s got the basic features that have historically been associated with the occurrence of coups. Most notably, it’s got a high infant mortality rate relative to most of the world, political institutions that combine features of democracy and authoritarianism, and sharply polarized politics. Now, it’s worth underscoring that the risk of a coup attempt in any one country in any given year is generally very low, even in the countries toward the top of those rankings. There are usually only a handful of coups and failed coup attempts worldwide each year, so the best prediction for even the highest-risk countries will almost always be that no coup will occur. If the forecasting models are working well, then all or nearly all of the coup attempts we do see will occur in the couple of dozen countries at the top of the annual rankings. Those rankings most definitely do not mean that we should expect to see coup attempts in all of those countries, and that certainly goes for Tanzania, too. Not everyone agrees as to what “development” means, but for most economists, development means increased standards of living, which are best measured via economic statistics such as gross domestic product (GDP) per capita, which may or may not reflect growth in the manufacturing and services sector of the economy. I think Marc’s right that it’s more useful to define (human social) development in ways that are agnostic of specific causes, and that many professional economists nowadays think in those terms. At the same time, I get a little uneasy whenever development is linked tightly to GDP growth. Being acquainted with Marc, I suspect that his aim in doing so is simply to make empirical analysis of development more tractable. Still, it’s also true that there’s a powerful strain of technocratic thinking in some quarters of economics, one that prioritizes growth over all other things, and this myopia can sometimes become pernicious. In a recent piece for The Atlantic, for example, Armin Rosen accuses Jeffrey Sachs, a leading candidate for president of the World Bank not so long ago, of turning a blind eye toward the human-rights violations of authoritarian leaders in his pursuit of improved standards of living in Africa and elsewhere. The technocratic mindset was also on full display in a now-failed plan for charter cities in Honduras pushed by economist Paul Romer, and it’s a recurring theme in the columns of Thomas Friedman, whom development professionals love to hate. In fact, even the driest definitions of human social development will inevitably carry a strong whiff of ideology, because the standards we set and the ways we measure progress toward them shape our behavior. Any definition of development implicitly or explicitly prioritizes some vision of the good life over others, and those visions generally entail some specific ideas about how to get there. The choice to include or expunge industrialization from a definition of “development,” for example, can influence what kinds of policies governments adopt in the pursuit or distribution of aid and loans tied to those metrics, and those policies can have vast consequences. This is not a concern that’s unique to economics. In American political science, at least, when someone talks about “development,” they often mean to invoke a cluster of economic, social, and political changes that Seymour Martin Lipset called “modernization.” That cluster includes the improvements in standards of living that Bellemare emphasizes, but it also includes the industrialization Rowden spotlights, along with other things like urbanization, education, the spread of liberal values, and, perhaps most important, the emergence of a specific form of political democracy. In short, to “develop” was to follow the specific trail of socioeconomic transformation from primitivism into modernity that was blazed by Europe in the 19th and 20th centuries, and that emphasis on mimicry has profoundly affected the ways the U.S. and Europe have tried to promote development. When Lipset was writing, modernization theory’s chief intellectual and political competitor was Marxism. For Marxist theorists, Europe wasn’t a model to emulate; it was a bastion of economic inequality and plutocratic “democracy” that would eventually and inevitably collapse under the weight of its internal contradictions. Industrialization was a critical feature of capitalism’s late stages that enabled maximal exploitation of labor by capital. It was both bad and good—bad because of the depths of exploitation it entailed, but good because it meant the end was nigh. Of course, it was the USSR and its European client regimes that actually collapsed, and in the two decades since, almost all of the purportedly communist states left in the world have abandoned their commitment to Marxism and adopted variations on the capitalist theme instead. That turn in international political economy has hardly killed class-conscious theory, however. Although the strict Hegelian version of Marxism is rarely seen nowadays, the concern with economic inequality and its political consequences remains a central theme in leftist politics. Flip this concern around, and we arrive at yet another definition of development. For many leftists today, development is about the spread of social justice, and the essence of social justice is not wealth but fairness. Industrialization, electoral democracy, and economic expansion are not things to be valued in themselves but means (or, in some cases, obstacles) to these deeper ends. Economic growth, modernization, and social justice are probably the three most prominent conceptualizations of development today, but they certainly aren’t the only ones. You might not think of libertarianism as a theory of development, but in an important sense it is. For libertarians, the good life is understood as one in which individuals are free to do as they please within only the sparest of constraints. Here again, industry, democracy, and growth are all beside the point. Liberty is the goal, and social and political changes that expand freedom can be understood as developmental gains. This idea finds one of its sharpest expressions in the Heritage Foundation’s Index of Economic Freedom, which that organization deliberately presents as an alternative to conventional measures focused on specific outcomes like poverty and education rates. All of which is a very long-winded reminder that no conceptualization of development can exist without an ideological foundation. That would be like a shadow without a light source, a hole when there is no surface. To talk about “development” is to set goals for human social improvement, and the choices we make in setting those goals are inherently normative. We can’t escape this circle, so we might as well be explicit about it. PS. Yes, I’m aware this has all been said a thousand times before, and often better. I decided to write the post anyway because it helped me organize some of my own thinking on the subject, and because the occasional reminder still can’t hurt. Has Africa Gone Coup-Crazy in 2012? Guinea-Bissau’s armed forces violently seized control of the country’s capital yesterday in an apparent coup d’etat. This is the second successful coup in West Africa in the past month–the other happened in Mali in mid-March–and, if my Twitter feed is any indication, this pair of events has a lot of people wondering if 2012 is going to be an unusually “hot” year for coups in that part of the world. Statistically speaking, the answer seems to be “no”–or “not yet,” anyway, and it still has a ways to go to get there. To see if 2012 is shaping up to be a weird year for coup activity in Africa, I used the ‘bcp’ package in R to apply a technique called Bayesian change point detection (BCP) to annual counts of successful and failed coup attempts in the region from 1946 through 2012 (so far). BCP treats time-series data as a collection of independent and identically distributed partitions and looks for points in that series where the data’s generative parameters appear to change. My data on coup events come from the Center for Systemic Peace. The results are shown below. The top half of the chart plots the observed annual counts (the dots) and the posterior means for those annual counts (the line). The real action, though, is in the bottom half, which plots the posterior probabilities of a change point. The higher that number, the more confident we are that a particular year marks a sudden change. In this series, we see evidence of three change points: one in the mid-1960s, a few years after the start of decolonization; another in the early 1990s, after the end of the Cold War; and a third in the late 1990s, when the rate of coups in the region takes a sharp dip. Meanwhile, the pair of events observed so far in 2012 looks perfectly normal, just about average for the past decade and still well below the recent peak of six events in 2008. If two coup bids in 2012 does not an aberration make, how many would we need to see this year to call it a significant change? I reran the BCP analysis several times using ever-larger counts for 2012, and it took a big jump to start moving the posterior probability of a change point in any appreciable way. 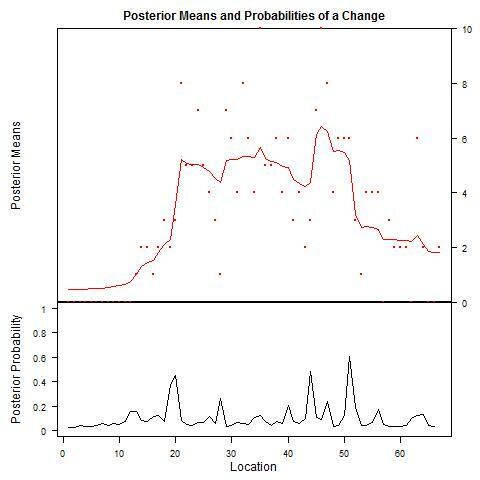 At five events, the posterior probability still hadn’t moved much. At six, it finally moved appreciably, but only to around 0.2. In the end, it took eight events to push the posterior probability over 0.5. In other words, it would take a lot more than two coup bids in 2012 to mark a significant change from the recent past, and what we’ve seen this year so far looks like normal variation in a stochastic process. Event counts are often noisy, but our pattern-seeking brains still try to find meaning in those small variations. It’s also harder to remember less recent events, and our brains tend to confuse that difficulty with infrequency. It helps to remember those biases whenever a new event starts you thinking about a trend. NOTE: This version of the plot and the scenario analysis corrects an error in the data used in the original post. For the first run, I forgot that my analysis file ended in 2010, so the 0 events shown for 2011 was a mistake. There were actually two failed coups in Africa last year, one in the DRC in February and another in Guinea in July. With those two events added to the data set, the first third of 2012 looks even more typical than it did before.